OLE DB Undeprecated! Long live ADO! The Microsoft SQLNCli team has undeprecated OLE DB and the news could very well be earth shattering for the Microsoft Access community. Previously deprecated and last supported with SQL Client 11, OLE DB was on it’s last breaths, and what was worse, we could not come up with a equivalent solution using DAO and pass through queries for all the features we had with OLE DB. Thankfully the team in charge of the connectivity drivers realized the huge impact and reversed the decision. Expect a new updated driver the first quarter of 2018 with great integration with SQL Azure. We can finally use ADODB with Azure AD integration in Access, something we can’t do with client 11. We no longer have to worry about re-writing a ton of applications using DAO only. We can continue to invoke ADODB commands in our code and interact directly with SQL Server without using a pass through query. 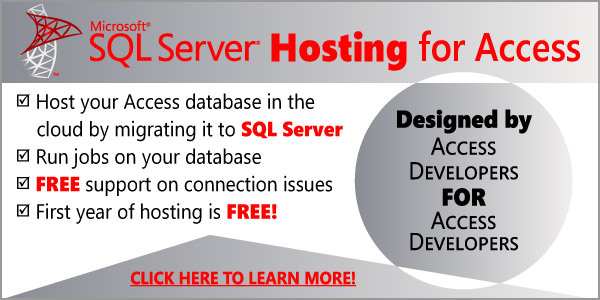 We can enjoy all the current and future capabilities SQL Server has to offer. Any dates identified for the release of the new OLE that supports TLS 1.2? Thanks Juan! This is super great news!